Visiting the world's most historic cities and hidden charms in casual comfort, river cruises have become increasingly popular in recent years. You’re likely familiar with trips on European rivers like the Rhine and the Danube or even themed river cruises that feature Christmas Markets or famous wine regions, but did you know there are also affordable river cruises allowing you to explore the world's most exotic waterways - places and ports that can't be reached by a traditional cruise ship? Traveling to the most foreign, farthest reaches of the planet can seem daunting, but an exotic river cruise combines safety and style for a smooth ride through the heart of the world's most remote, hidden and off-the-beaten path places. An exotic river cruise is the best way to explore the world's most remote rivers (Aqua Expeditions). An exotic river cruise means your luxury hotel travels with you as you explore ancient sites, experience magnificent cities and immerse yourself in the local culture and cuisine of Asia, Africa, India, the Amazon and more. Insider Tip: Intimate and immersive shore excursions are a highlight of the exotic river cruise experience with smaller tour groups, private skiffs, customized outings and local guides who lend their expertise to every off-ship adventure. There are some similarities between an exotic river cruise and their European counterparts, but exotic river cruises are typically at least 10 days to two weeks or longer, offer a better mix of small towns, villages and ancient sites, and you'll likely spend less time on the water than you'd expect as many included longer stays, cruise/tour combinations and even overnights in bigger cities. If you're looking for something truly unique for your next unforgettable vacation, consider one of these exotic travel options recommended by the experts at CruiseInsider. 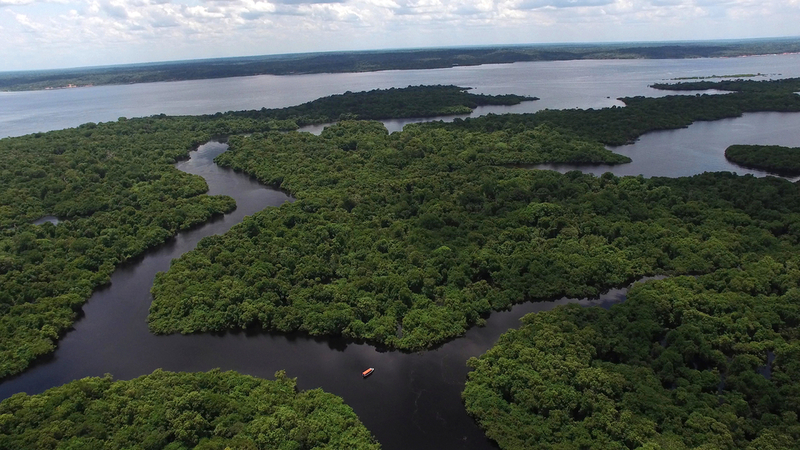 There are multiple cruises that offer the opportunity to explore the wild and tropical Amazon. The legendary river flows through Peru, Bolivia, Venezuela, Colombia, Ecuador, and Brazil before emptying into the Atlantic, but the Peruvian Amazon River basin is a stretch that’s particularly enthralling. Explore the Amazon rainforest in Brazil, South America on a river cruise voyage. 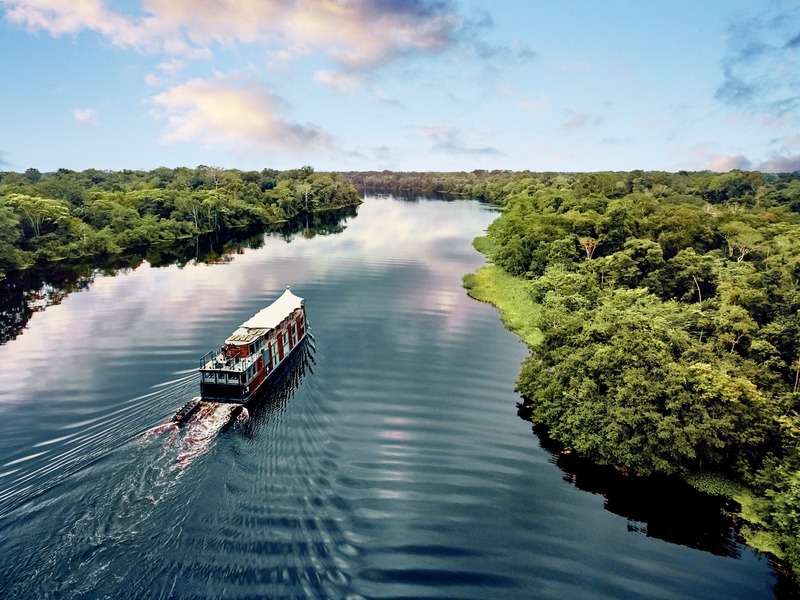 While most itineraries on larger vessels are limited to sections between the Brazilian ports of Belem and Manaus, smaller river cruise ships are made for venturing further upriver and incorporate the region’s more exotic and underdeveloped areas. For example, Lindblad Expeditions will bring you to the incredibly biodiverse Pacaya-Samiria National Reserve where you’ll have the chance to encounter sloths, howler monkeys, rare pink dolphins, colourful macaws and an astounding variety of other bird life. Experience traditional village life firsthand on the 9-night Upper Amazon Cruise from Lindblad Expeditions that begins and ends in Lima, Peru. 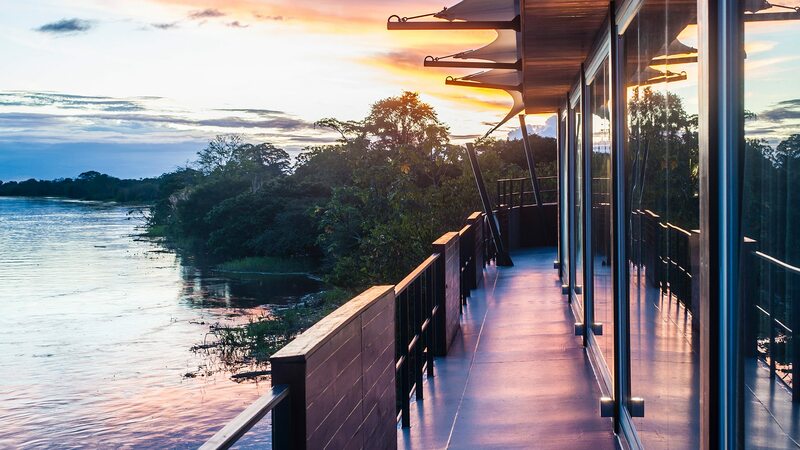 Insider Tip: The region's "wet season" is the better option for many first-timers because of the higher water levels that make it easier to explore the Amazon's smaller tributaries, enjoy the forest's "bloom" and see a richer variety of wildlife. Civilization has flourished around great rivers throughout history, and the Mekong is no exception. One of the world’s most diverse and dramatic waterways, the Mekong River flows through China, Myanmar, Thailand, Lao PDR, Cambodia and Vietnam. While these countries and cultures do share some similarities, they each offer plenty of their own unique characteristics, ancient sites and dramatic landscapes, and are considered one of the most earth's most exotic ecosystems. The observation deck views on Aqua Expeditions' Aqua Mekong are second-to-none. Vietnam offers an incredible mix of flavors and fun, having been influenced by China for a thousand years, with incense-filled temples, bonsai, calligraphy and more. And Cambodia borrows more from Thailand in its culture, favoring Buddhism, Hindu architecture, curries and traditional wai greetings. Aqua Expeditions’ luxury river cruise ship, Aqua Mekong, explores the Mekong basin in all-inclusive elegance, with expert guides on board, a state-of-the-art vessel and immersive excursions from the only private fleet of launch boats on the Mekong river. Insider Tip: Aqua Mekong has four ergonomically-designed launch boats that offer highly personalized day trips to landmarks, temples and villages where tradition, spirituality and craftsmanship reside. The opportunity to discover rich heritage and traditions enriched by 2,000 years of human history is what makes the Mekong river cruise one of Asia’s most epic and worthwhile journeys on water, and one of the few cultural destinations on Earth that’s best explored on an exotic river voyage. 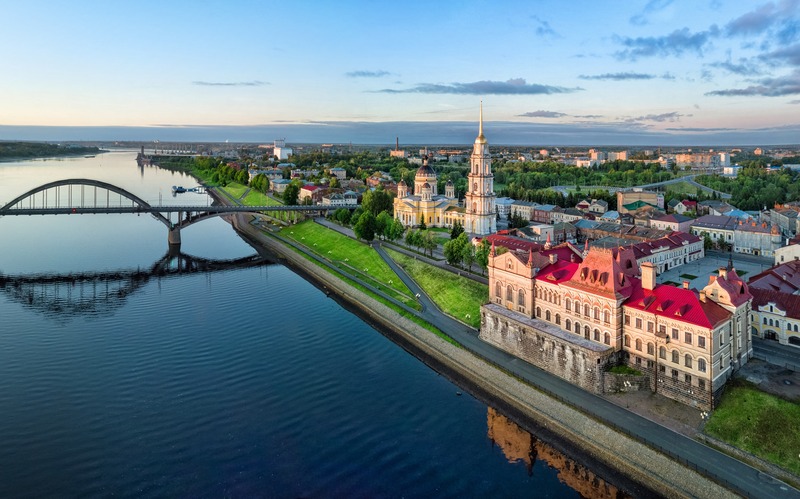 A cruise on the Volga is where travelers can experience old and modern Russia, visiting both the country's most important large cities – Moscow and St. Petersburg – and some of the more quaint, historic towns along this legendary river. Russia's iconic Volga River allows you to see the beauty of the real "old country." Voyages typically go from late spring until early fall, and will allow you to economically explore iconic landmarks like the Kremlin and Red Square in Moscow, or take a stroll around St. Petersburg’s Catherine Palace, not to mention the luxurious palaces, magnificent cathedrals, fortified monasteries and more dotted throughout this historic and humbling region. Viking River Cruises offers several cruises between St. Petersburg and Moscow that reveals the real Russia as never before, even showcasing Russia’s rural side, like Yaroslavl and Uglich. With five ships and a variety of voyages to choose from, Viking's fully refurbished, elegant Russia fleet sets new standards of excellence in this region. Insider Tip: May through late July, the midsummer night skies are lit by the sun in this northern region. You’ll be able to experience St. Petersburg’s magical skyline during this period that’s referred to as the White Nights, when the evening sky never darkens. The Volga meanders through Russia’s cultural heart — introducing you to many of the country’s most memorable highlights and through the most idyllic and historic landmarks of Russia. It's a beautiful glimpse behind the veil of a country that has stayed wrapped in mystery and intrigue for centuries. A journey on the Nile River, the world’s longest and most well-known river, is arguably the best way to experience Egypt and its incredible historic sites. Flowing north out of Lake Victoria, and meandering through Uganda, Sudan and Egypt, you'll see everything from the Great Sphinx of Giza to the famous pyramids, while passing rain forests, mountains, savanna and desert before ending in the Nile Delta along the Mediterranean coastline. 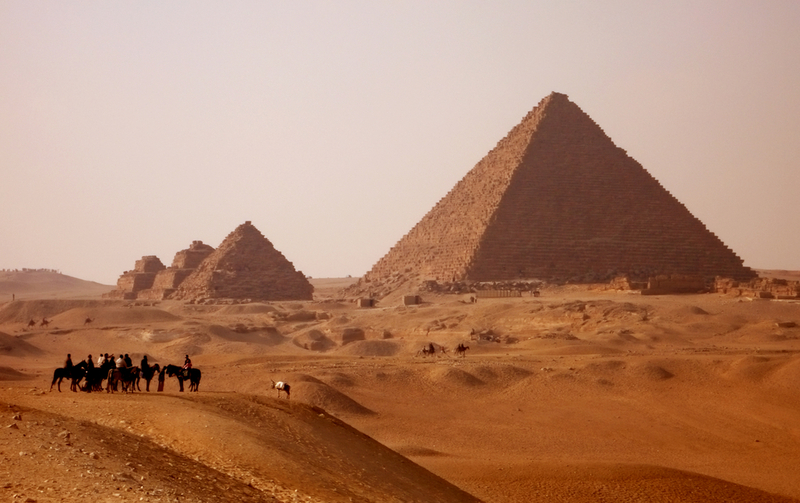 See the Giza pyramids near Cairo in Egypt at sunset. While several cruise ships sail its waters, Uniworld's brand new S.S. Sphinx – the only luxury river cruise ship in Egypt – will set the standard for elegance in exotic river cruising. Making her debut on the Nile River in 2020, the S.S. Sphinx will bring the beauty of the region to life onboard with the Splendors of Egypt and The Nile voyage - a 12-day roundtrip journey from Cairo along the world's most iconic river. While a traditional land safari is the most popular way to enjoy Africa's wildlife, one of the newest, easiest, and most efficient ways to see take in all that Africa offers is an exotic river voyage. As your comfortable ship cruises smoothly along the river, animals perceive no threat, affording you with once-in-a-lifetime up-close wildlife experiences. You can see a myriad of animals - including safari's "Big 6" - on a Chobe River cruise. Fifty miles from the breathtakingly vast Victoria Falls, the game rich Chobe River runs through the northern part of Botswana’s Chobe National Park, eventually flowing into the mighty Zambezi River. 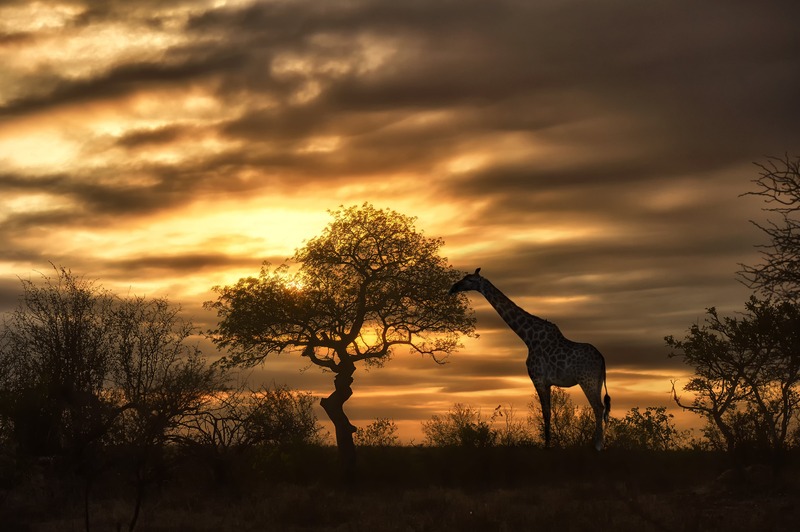 This renowned, reed-lined river is a haven for wildlife viewing throughout the year, with travelers typically seeing giraffe, antelope, sable, buffalo, lions, jackals, leopards, baboons, kudu, hyenas, crocodiles, monkeys and impalas. Insider Tip: For the best chances of seeing wildlife along this waterway, book your voyage during the dry season from April through October, when water inland is scarce and migratory animals head towards the Chobe River. Designed specifically for wildlife viewing with unobstructed views of the river and African landscape, think about a trip on AmaWaterways' intimate 28-passenger Zambezi Queen. This African-themed, environmentally-friendly ship was designed to ensure no harm comes to this sensitive ecosystem, using water jet propulsion, fuel-efficient and low-emission generators, and a solar heating system. A cruise on China’s Yangtze River, the third longest river in the world, is a spellbinding odyssey through 5,000 years of Chinese culture and history. 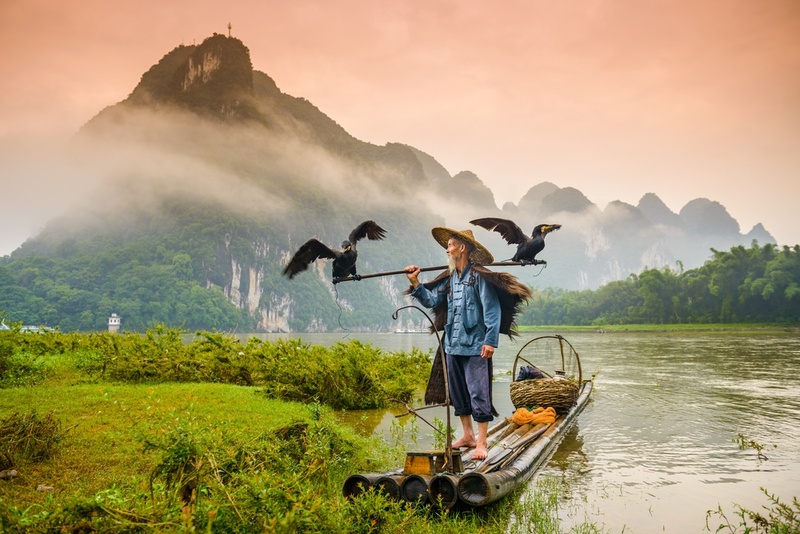 Ideal for history buffs, wildlife lovers and anyone who wants a taste of the Orient without immersing yourself in a particular place, an exotic river cruise is the perfect way to explore China comfortably – a country that can be considered "overwhelming" to some. Life slows down along China's legendary waterway, the Yangtze River. From China’s staggering architectural monuments—the Forbidden City, Summer Palace and Great Wall—to passing the centuries-old pagodas along the banks to the natural beauty of the Yangtze River’s Three Gorges, one of the most impressive stretches of scenery with 80 miles of spectacular landscapes, this itinerary highlights China’s history, culture and timeless wonders. Insider Tip: Many exotic, endangered species can be seen along the Yangtze as well, including the rare Chinese alligator, giant salamander, the Yangtze river dolphin, giant soft-shell turtle and more! Uniworld River Cruises offers the 10-night Highlights of China & The Yangtze Cruisetour that begins in the exciting city of Beijing and ends in Shanghai, with four days of cruising on the river. You'll be among the first aboard Uniworld's brand new Sanctuary Yangtze Explorer, with its lavish features, the largest cabins and suites on the river — all with private balconies – and an unheard of 1:1 crew to guest ratio ensuring superior service down to the smallest detail. The Ganges River flows through India and Bangladesh, and holds a very strong spiritual significance among the local people. 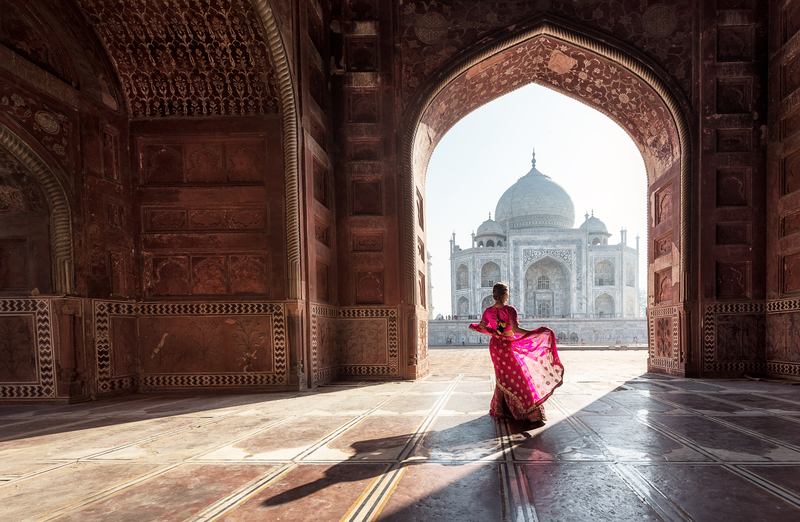 Wondrous sights rich in romance and intrigue come alive in the “Golden Triangle”—Delhi, Jaipur and Agra—and you will see it all in style, safety, and in spacious accommodations. The legendary Taj Mahal in Agra is one of most beautiful buildings on the planet. Profoundly mysterious and gloriously exotic, there is no better way to delve as deeply into India’s fascinating historical and religious heritage than a boutique river cruise on Ganges Voyager II, a floating five-star hotel you can only experience with Uniworld Boutique River cruises. Insider Tip: Authentic excursions are an absolute high point on Indian itineraries, with experiences on local life in rural India, exploring Udaipur’s architectural marvels and palaces, and even boarding a trishaw—a pedal-powered three-wheeled rickshaw—through the streets of Kalna. Experience India's colorful bazaars, ancient temples, colonial-era mansions, and energetic city streets on this epic and exotic journey for culturally curious travelers looking for a truly immersive and unforgettable river cruise experience. For more exotic river cruise itineraries and the most up-to-date information and insider savings, speak to our river cruise experts at CruiseInsider by calling 1 (877) 734-6858 or click here to find an exotic river cruise perfect for you.